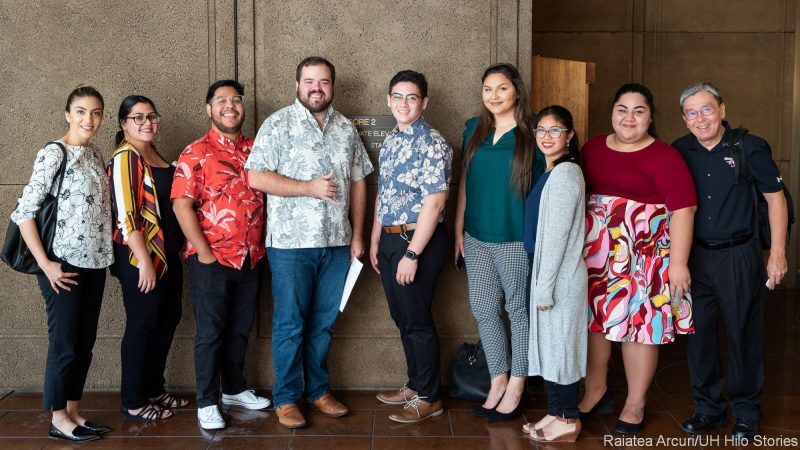 UH Hilo student leaders watched opening ceremonies of the 2019 Hawai‘i State Legislature and met with members of the Hawai‘i Island Delegation to discuss topical issues on Wednesday. 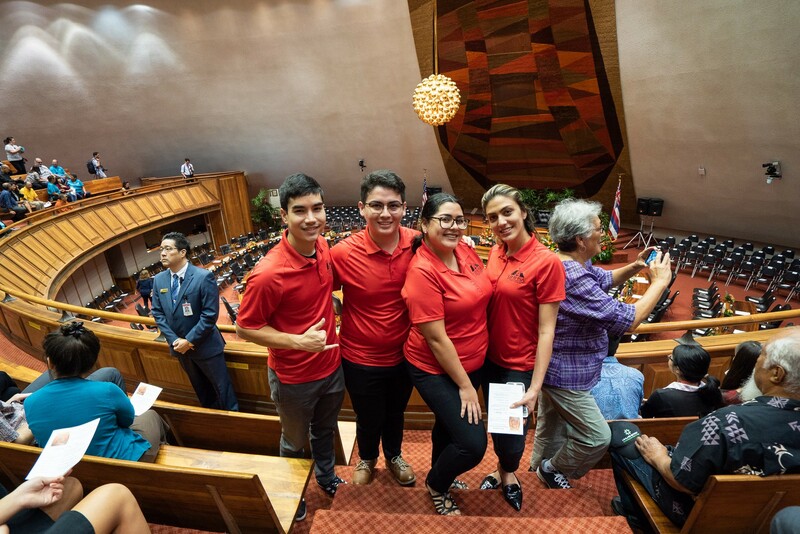 They are spending three days at the capitol as ambassadors of UH Hilo. 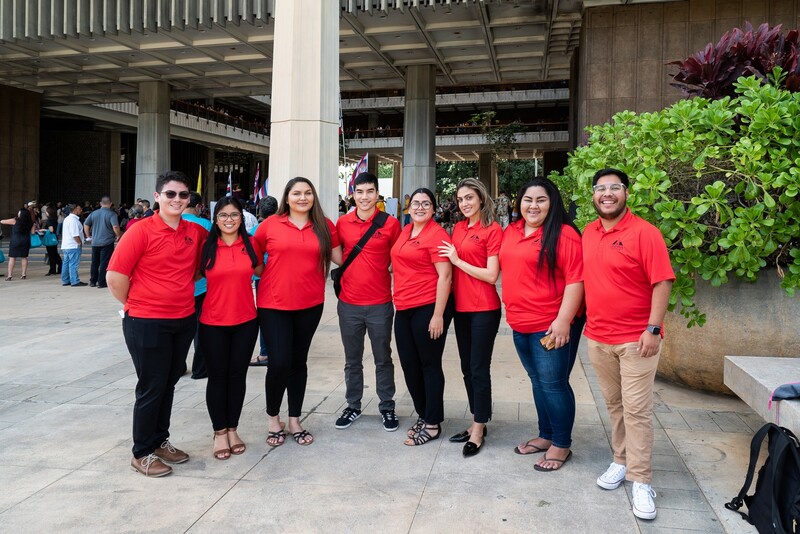 (L-R) UH Hilo students Micahel Taylor, Angela Ituriaga, Victoria Taomia, Raiatea Arcuri, Kiana Suganuma, Niloofar Soltanipour, Lottie Haleck, and Caesar Mendoza at the Hawai‘i State Capitol on opening day of the 2019 Session of the Hawai‘i State Legislature, Jan. 16, 2019 . Click photos to enlarge. Capitol grounds. These three photos and others as noted on the images by Raiatea Arcuri. (L-R) Angela Ituriaga, Caesar Mendoza, Victoria Taomia, and Lottie Haleck. (L-R) Raiatea Arcuri, Michael Taylor, and Kiana Suganuma. 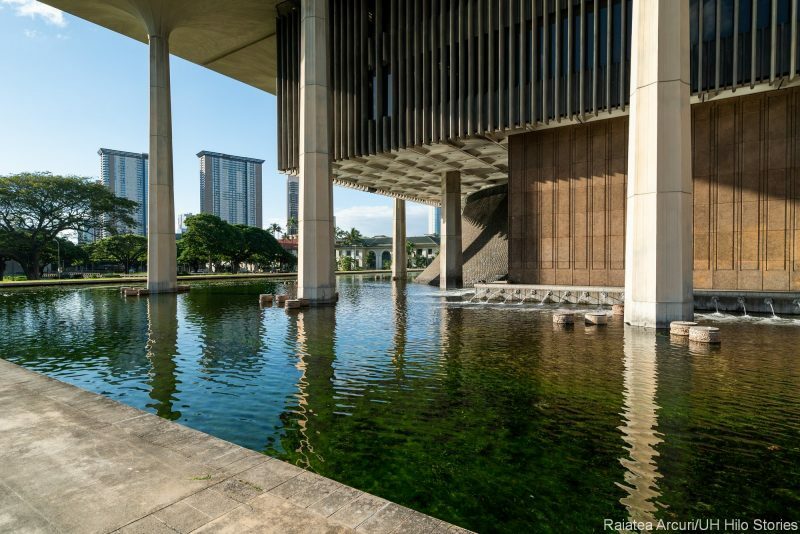 Opening day of the State Legislature, Jan. 16, 2019. 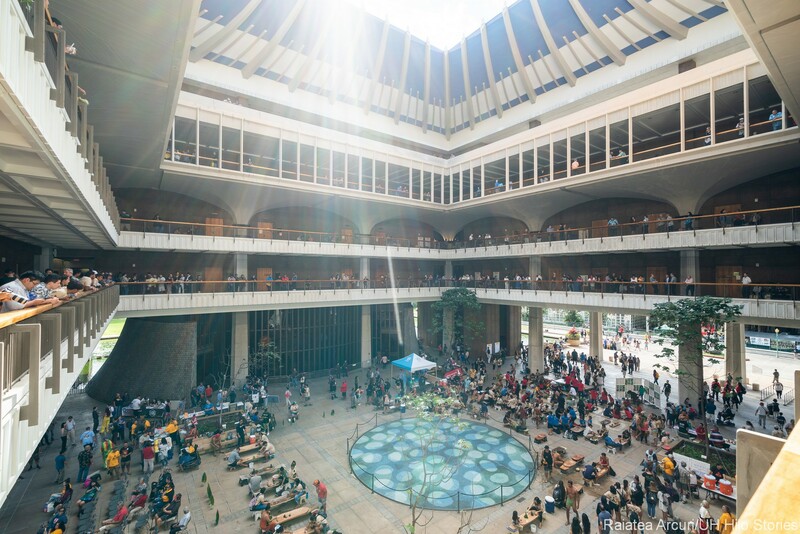 Student leaders from the University of Hawai‘i at Hilo are attending the first three days of the opening session of the Hawai‘i State Legislature, Jan. 16-18. 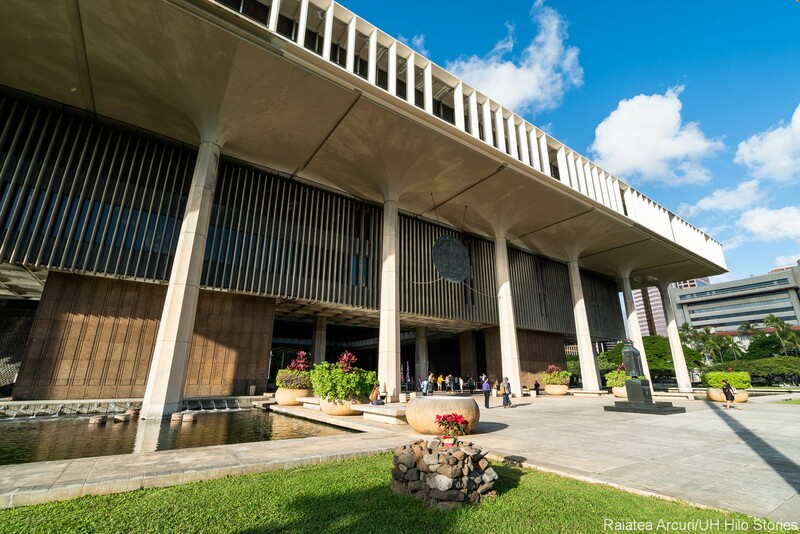 They have met with most of the Hawai‘i Island delegation including Sen. Russell Ruderman and Representatives Richard Creagan, Nicole Lowen, Mark Nakashima, Richard Onishi, Joy San Buenaventura, David Tarnas, and Chris Todd. 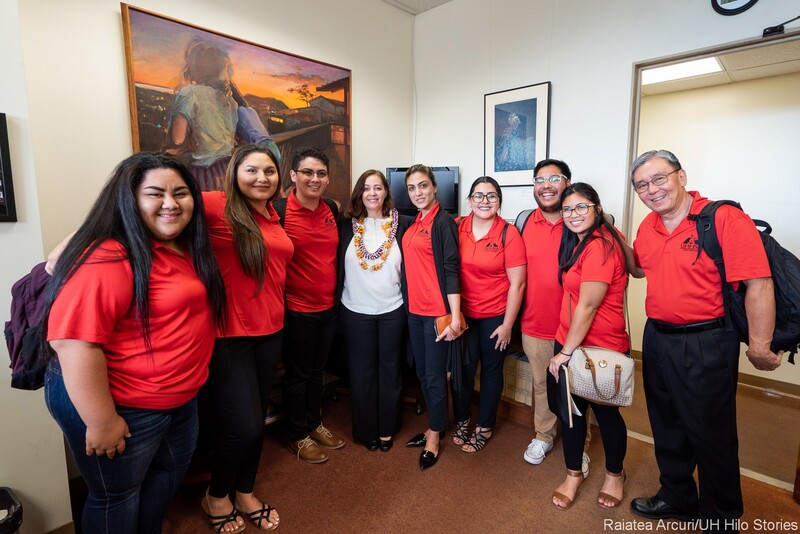 Senators Kai Kahelei and Lorraine Inouye were in meetings but their staffs hosted the students for lunch on Wednesday. 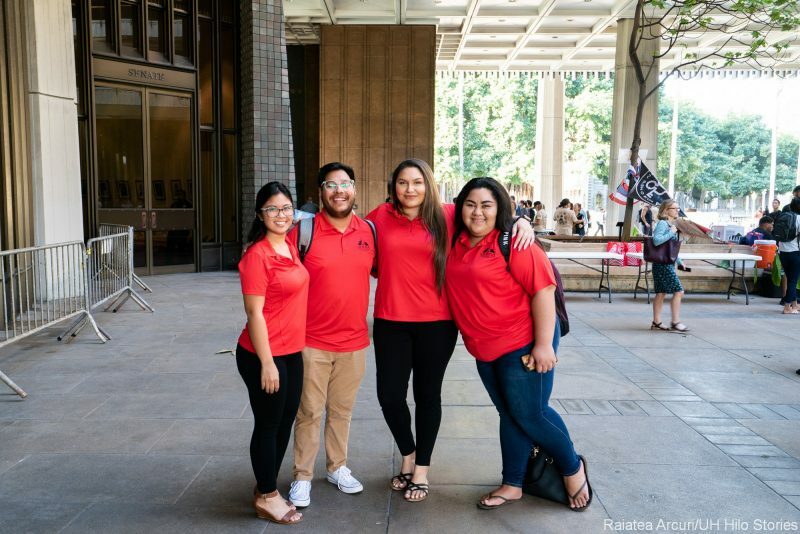 Most of the students are senators of the UH Hilo Student Association (UHHSA). 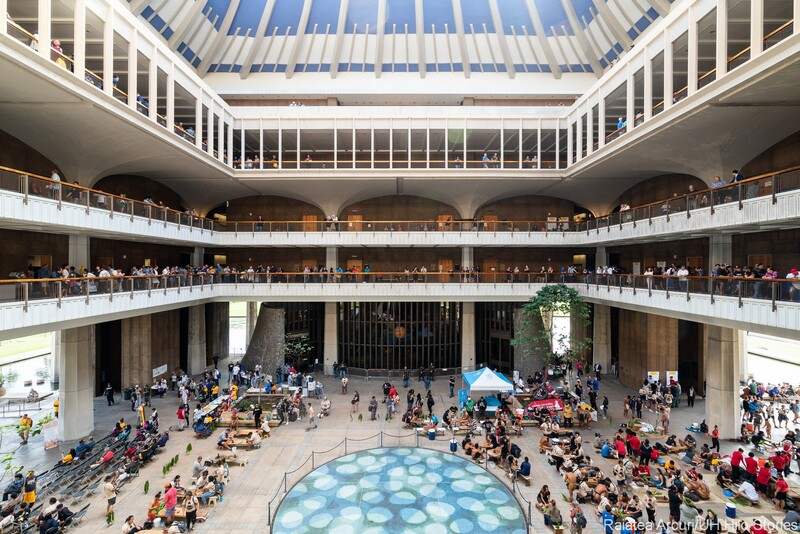 “The students are learning a lot, and the legislators are being very generous with their time,” says Randy Hirokawa, who is UHHSA advisor and is accompanying the group on their trip. 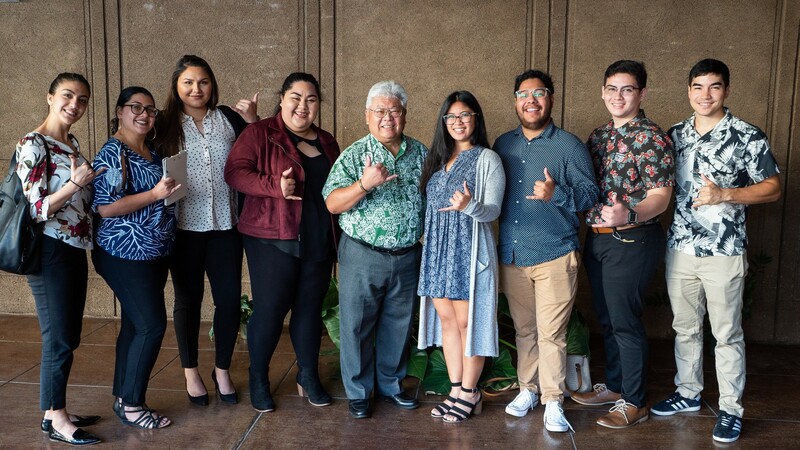 (L-R) Michael Taylor, Victoria Taomia, Caesar Mendoza, Representative Mark Nakashima, Governor David Ige, Kiana Suganuma, Niloofar Soltanipour, Angela Ituriaga, Lottie Haleck, and Advisor Randy Hirokawa. 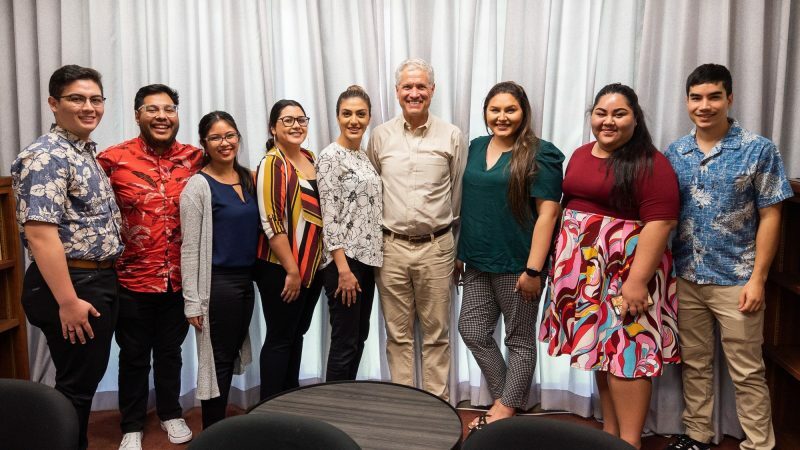 (L-R) Lottie Haleck, Victoria Taomia, Michael Taylor, Representative Nicole Lowen, Niloofar Soltanipour, Kiana Suganuma, Caesar Mendoza, Angela Ituriaga, and Raiatea Arcuri. (L-R) Lottie Haleck, Victoria Taomia, Michael Taylor, Representative Nicole Lowen, Niloofar Soltanipour, Kiana Suganuma, Caesar Mendoza, Angela Ituriaga, and Advisor Randy Hirokawa. 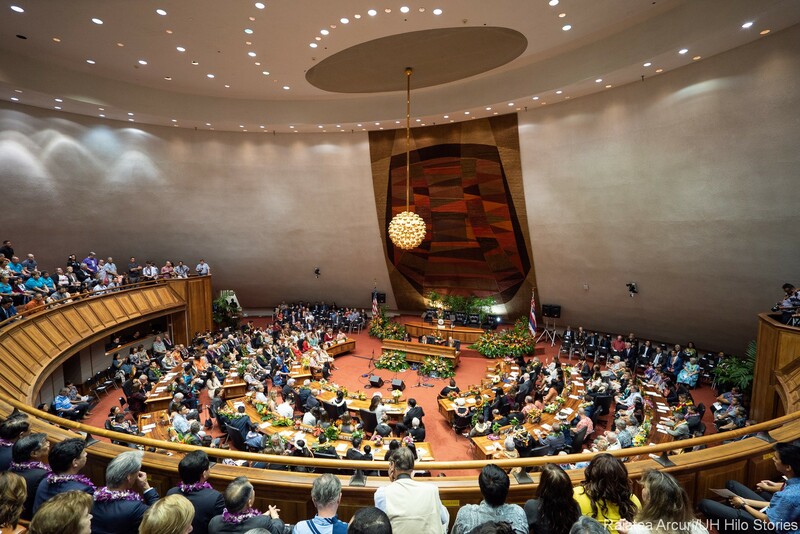 (L-R) Advisor Randy Hirokawa, Michael Taylor, Victoria Taomia, Caesar Mendoza, Representative Mark Nakashima, Governor David Ige, Kiana Suganuma, Niloofar Soltanipour, Angela Ituriaga, Lottie Haleck, and Raiatea Arcuri. Lawmakers shared information with the students on a variety of topics. Rep. Todd, a UH Hilo graduate (economics and political science) explained to the students how people ascend to leadership positions in the House and Senate. He also explained the politics involved in passing bills. 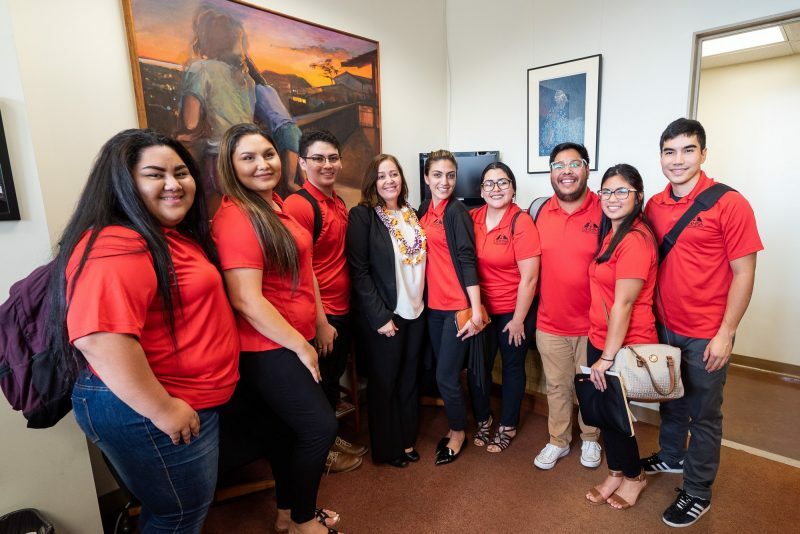 Sen. Ruderman and Rep. Joy San Buenaventura explained to the students how they can get involved in supporting bills relevant to Hawai‘i Island, such as the bill to allow people to give testimony via electronic technology. 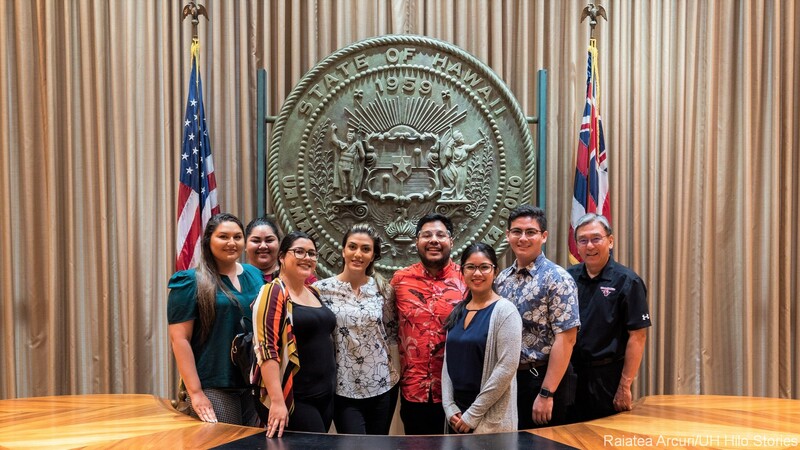 UH Hilo delegation in the Governor’s Chambers, Jan. 17. 2019. Click photos to enlarge. 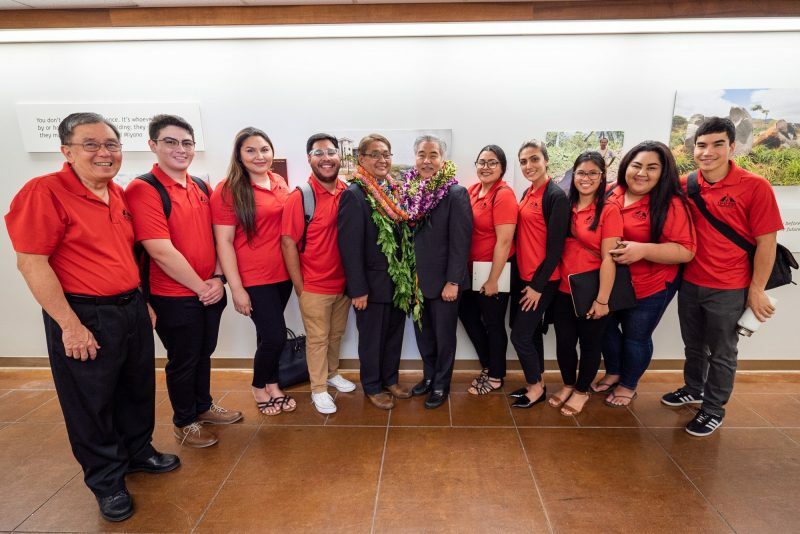 UH Hilo delegation with Hawai‘i Island Rep. Richard Onishi (center in aloha shirt), Jan. 17, 2019. 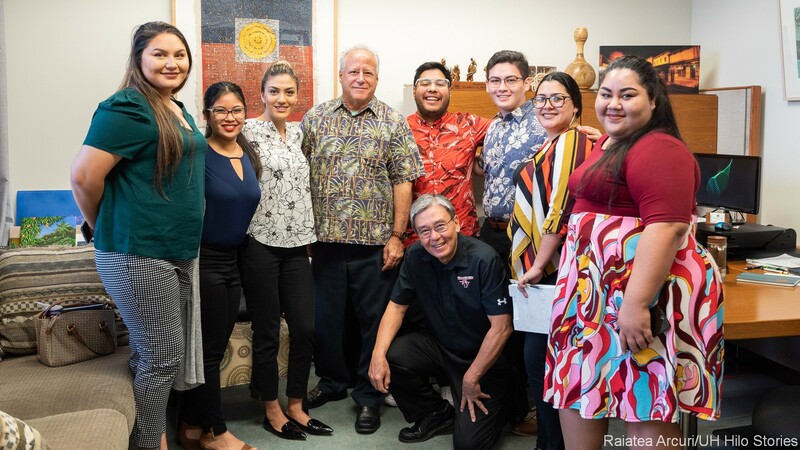 UH Hilo delegation with Hawai‘i Island Sen. Russell Ruderman (center back), Jan 17, 2019. UH Hilo delegation with Hawai‘i Island Rep. Chris Todd (center left in jeans), Jan. 17, 2019. 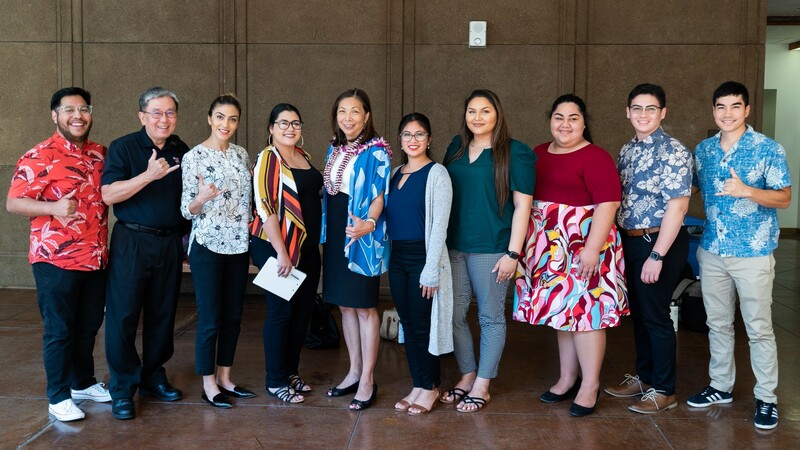 UH Hilo students and advisor stand with Rep. Joy San Buenaventura (center in lei), Jan. 17, 2019. 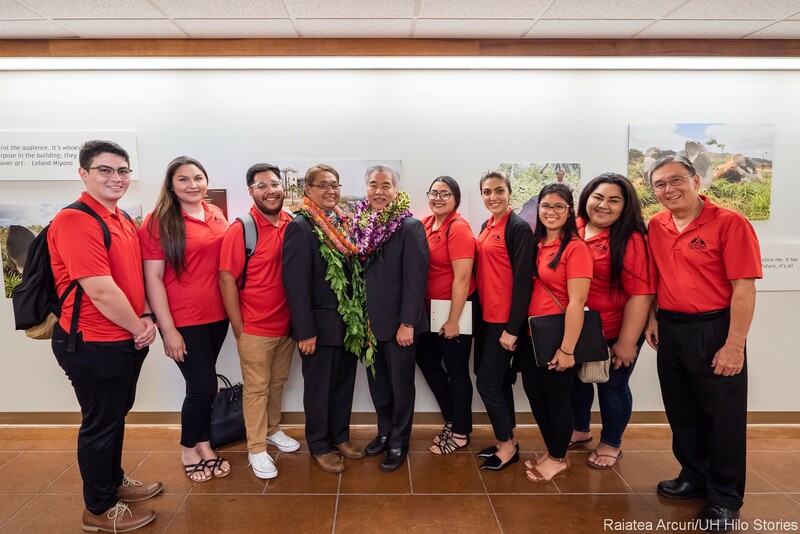 UH Hilo students stand for photo with Hawai‘i Island Rep. David Tarnas (center), Jan. 17, 2019. Rep. Creagan gave a mini talk on rat lung worm disease and why research dollars are needed for it. Rep. Tarnas explained why the development of Puako for marine research is important. 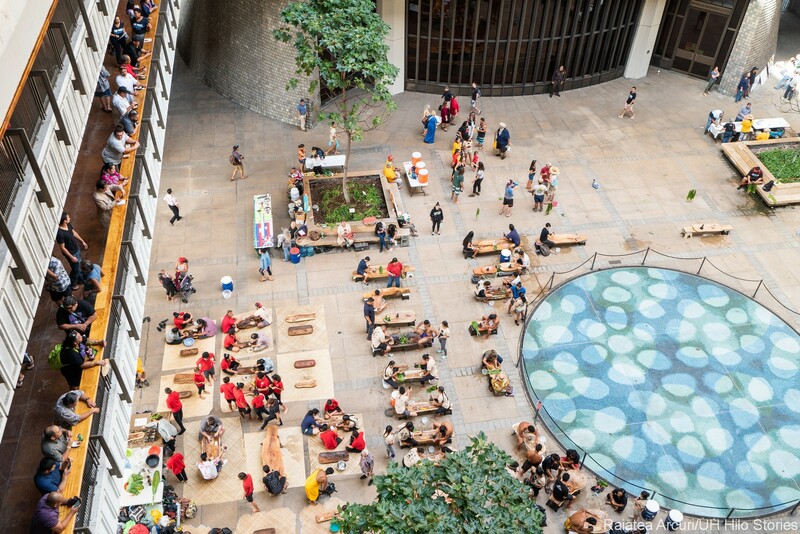 Rep. Nakashima explained to them how environmental issues and opposition are working against new energy initiatives in Hāmākua, and how it led to the dairy business going under in ‘Ō‘ōkala. His point was that issues are more complex than it seems to the public. “In short, students are learning the stories behind the politics in ways they would never learn in the classroom only,” says Hirokawa. Looking down at activity in the open rotunda at the Capitol, opening day of the State Legislature, Jan. 16, 2019. Looking down into the open rotunda at the Capitol, opening day of the State Legislature, Jan. 16, 2019. Photos by Raiatea Arcuri are noted with watermark on the photo. 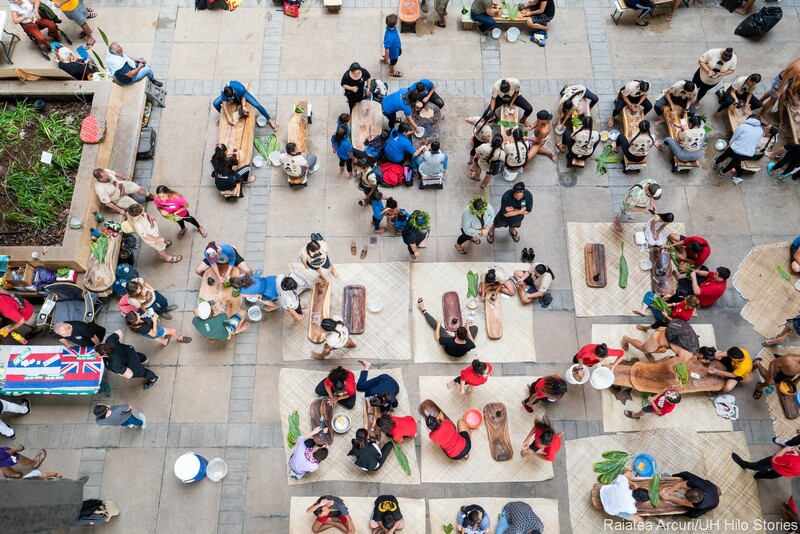 He is a professional photographer majoring in business at UH Hilo and is an intern in the Office of the Chancellor. Other photos in the story are taken by various other members of the group.